To paint-along, please visit my etsy shop and obtain the online class at: http://watercolorgirl.etsy.com. 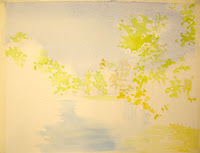 Using various mixtures of Aureolin Yellow, Permanent Sap Green and a touch of Burnt Sienna, apply some foliage to the sunlit areas of the trees. I call this application a Brush Dance, due to the fact that the non-working end of my brush flops, or dances around in different directions. This movement helps to keep the brushwork looking fresh and non-uniform. Now, use a little of the Burnt Sienna, very wet, and add a small area of "dirt" to the horizon line and to the riverbank where the sun is shining on the dirt. This application needs to remain relatively light in value as we will add more color, detail and shadow later on. 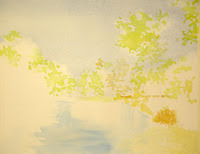 To learn more about my classes and workshops, please visit http://watercolorworksart.com/Classes.